Happy Halloween! As usual, I tried to create a surprise Halloween game for you. Like two years ago, I failed. And in exactly the same way. I decided to create a quick game made out of Supreme's code, and instead made it too involved and unique to be done quickly. The previous result was Loonyland, which ended up taking 5 months. For whatever stupid reason, I have hopes this will take less time than that. But it's not even in the realm of done yet. So what is it!? 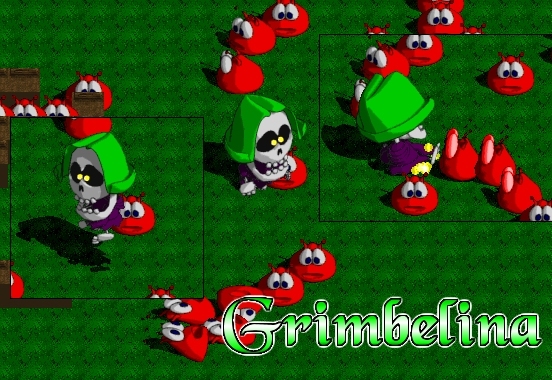 It's Grimbelina! Sol came up with the absolutely brilliant notion of naming it Soul Hunt, but I'm not sure yet. Doing that would almost definitely be writing off Sol Hunt for good. Maybe I should have a vote on that. Anyway, Grimbelina is the daughter of the Grim Reaper, who went away to a convention after warning her as he always does when he leaves the house, "Keep your boney mitts off of the Well Of Souls!". Of course, being a kid, she couldn't do that, and now hundreds of souls have been released, and she has to recapture them all before he gets home. To make matters worse, a team of government agents have arrived nearby to investigate the paranormal disturbance. Royal pummelings ensue! Gameplay revolves around beating guys up with nifty combos, including juggling them into the air, or grabbing them and throwing them around (in the main shot above, you can see she's just smacked one guy downward, which knocked down a few others too, underneath the "G"). By beating them up rapidly and making big combos, you level up and earn points to learn new moves with, or upgrade your stats. There are tons of moves that you gain access to as you proceed, but they're all done very simply, with a two button system (Attack and Jump). The tiles you see in this shot are just leftovers from Supreme, as I haven't made any tiles yet, but the graphics in Grimbelina will be all new - it's going to have an extremely simple, colorful, cartoony look (you can see that in the characters, I hope). And yes, you will be able to create your own monsters, levels, adventures, and playable characters! It will require some computery knowledge to pull off, however. And you won't be able to create your own monster graphics. The fun will be in creating new moves and combo possibilities. Of course, that's all subject to change! So that's Grimbelina, or Soul Hunt, or Grimbelina's Soul Hunt, the big surprising new game from Hamumu Software, coming... maybe soonish! I didn't know the rules in advance. In fact, I asked him the rules and he said "We don't know them yet, but probably a 2 minute run, high score, on any level you want". It was high score, 2 minute run, 2 players at once (which means split screen, which confused me! So tiny! ), CAN ONLY BE TONY HAWK HIMSELF, on The College level, with no upgrades, and no editing your tricks - defaults all around. Tony Hawk is a vert skater. Vert skaters are not fit to lick my wheels! I don't know any of Tony Hawk's specials, which are the key to getting scores! My practice run (you got 1min practice, then 2min real) was just slightly under the score that ended up winning the competition (350k-ish). But I got that score in only 1 minute!! On my real run... I wasn't doing too hot, lowish score, but then when there was one second left on the clock, I knew I had to get going to win this thing (you can continue after the time runs out, as long as you maintain a combo; once your combo ends, the run is over), so I started The Ultimate Combo. It ruled like nobody in that store had ever seen. It probably lasted another 20 seconds. I got cheers! My run was the most exciting one of the day, the kids loved it! But, at the end, I knew I had to land it, or it would count for nothing, so I headed out onto flat ground, and set the controller down to avoid my automatic instincts to keep pounding buttons. Unfortunately, I was still in a manual at that time, so I fell down. The amount of points I lost by failing that combo would've put my score way above the winning score for the competition. The combo itself was worth more than the total winning score! All I had to do to win the contest was to hit the X button one more time. Once. No skill involved, just tap the X button. Also, the guy running the contest swapped my score with my opponent's - luckily he had done well too, so instead of being counted as 190k points, I was counted as 140k. In the end, I got 6th place, and the top 5 scorers got T-shirts. I would've been 4th place with my actual score, and of course let's not forget second place (maybe first, about that area) with my score from my practice run (in only 1 minute!! Dagnabbit! ), or way out in first with my score if I had just hit that stupid button! BUT, to compensate for the horror of having to play as a stupid vert character, virtually without special moves (I got off a couple special grinds, but never figured out how I was doing it), on a crappy level, which rendered all my awesome practice meaningless, and also the suffering of looking really silly as the only elderly gent competing against a vast army of 20 or so 10-15 year olds, the universe smiled down upon me, and lo 5 shirts became 6. They had 6 shirts on hand, and I am now the semi-proud, sorta-dejected, owner of a Tony Hawk's Underground t-shirt! HOORAH!! That's really great. I would've been way happier with the game, but I blew it with that stupid X button stunt, so it's my own thing. But the t-shirt is really cool, since I always need more of those for free. So I didn't win Tony Hawk 5... good news for you all, because it means I will actually spend time working on my next game! PS - you're in even more luck... they're having another contest next month, but it's an SSX contest. And I believe we've discussed in this very space just how horrifically unplayable the garbage that they call SSX is. I will be skipping that crapfest. It's sad... Tony Hawk is the only game (besides UT!) that I'd really enjoy competing in. And I'm good at it! I did so good!! I didn't do 6th place good, I did 1st place good! Oh well... let the kids enjoy their games. I'm a grown up or something. That X button will haunt me forever. There was a raccoon in our yard last night! Huzzah was very puffy looking out the window, so I looked with him and there was this huge raccoon, about twice his size (and he's a BIG kitty!). It was cute. We went from window to window, got the flashlight, and generally enjoyed a half hour of National Geographic: Temeculan Safari. He rattled our trash cans a bunch, then sat in our backyard cleaning himself and scratching for a long time. He better not have brought fleas into our yard - that's my biggest fear when we occasionally let the cats out. I've been in a house truly infested with fleas before! So that's the story of our first raccoon. He looked awfully comfortable here, so he'll probably be back. We get tons of neighbor cats in our yard, that really upsets Huzzah. Sometimes I have to chase them away because he gets so upset. He was less upset with the raccoon, maybe because it kinda looked like him. Either that or he was just struck speechless with terror. I also sold my first order to someone who lives in Temecula the other day! She lives on a street inches from my house, so I was going to deliver it by hand, but then I looked it up on Mapquest, and discovered that the specific part of that street she lives on is about 4 miles away. And I'm lazy (and shy), so in the mail it went. Okay, I've done a million point combo. But just once. My record for a run is up to about 1.4mil... my average is staying around the 500k range. I think I'm improving though. Sure wish I knew the rules! Everybody knows Tony Hawk is the greatest game of all time. Well, we got a Gamecrazy flyer in the mail with an ad for a Tony Hawk 4 contest at our local store! I signed up! The sign up list had ages on it... there are like 20 people on it (so far... and the contest isn't until the 25th, gulp), and ALL of them were between 11 and 14 years of age, except one 25 year old. At least I'm not going to be the only one embarrassed to be there. Although, I have a feeling my embarrassment will be larger than his, because I was practicing, and I'm seeing some problems with my ability to dominate this stuff. See, I did research online about what big combos are and all, and I'm quite worried. So far, my best practice run has been just over 1mil points. That's my best, and second best was more like 700k, and average is more like 4-500k. These videos of big combos you can find online are 6mil to 300mil, for one combo, not an entire 2 minute run of separate combos. Oh well, wish me luck, and let's just hope these local yokels aren't such pros... maybe today's kids' brains are rotted by RPGs, so they aren't good at Tony Hawk! If you care, you can check out some really amazing combo videos online, look for them! Even if you know nothing about Tony Hawk, pick one with a big score on it and check it out (if you have broadband - they're not small videos). It's just amazing to witness, even if you think there's only one button press involved in each move they do (which is definitely not the case), it's a constant stream of insane madness, and remarkable long-range jumping aim. I wonder how often they have to buy new controllers. I got rear-ended today. Blech. It was minimal speed, no damage except the bumper got crushed in (it's plastic). But you know, I wanted to NEVER HAVE TO DEAL WITH THAT! I hate it! Now I have to go get it fixed, and talk to the person who hit it to tell them what it costs, and all that fun, and they get to try to argue with the estimate as if they have any say. It suxorz. We got a new couch after suffering through the eternal torment of Ikea (as the wife says, "NEVER AGAIN!!!! "), and the cats love it. They are very happy! They don't like getting sprayed with water constantly for trying to scratch it, but when they're not scratching it, they sit around it or on it very happily. I don't mind it myself. You can look it up in the Ikea catalog, it's the Fagelbo (should be an umlaut over the a or something, but I'm no HTML superstar). We got it in Boeryd (again, pardon the missing umlaut). That's a color. Isn't Ikea amusing? I also got Dungeon Siege (PC game) today! It's because we had a huge Staples gift certificate due to my wife's Teacher Rewards card there, and if you don't use it all it once, what's left vanishes. We had to get the game, I'm afraid, or it simply would've been wasted. So sad. We did good though - by adding the game on, we came within 90 cents of the total amount, without going over. If I had realized that before we were completely rung up, I would've added a candy bar. I do love candy. We also used up an Amazon gift certificate just yesterday, something else I enjoy doing. I am way overstuffed from dinner, but I promised to make Krispie Treats, so awaaaaay I go.